Thou must go by a way that thou possesseth not. 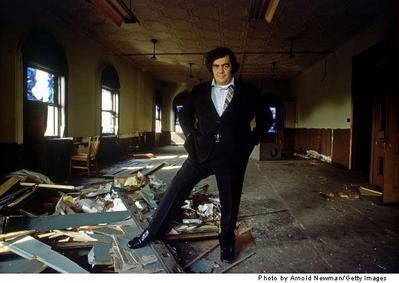 Jimmy Breslin, Pulitzer Prize winning journalist and author, poses for a portrait May 19, 1971 in Brooklyn, New York. "What is poetry? The truth burning through lies? burning a whole forest of lies down." Jimmy Breslin (born October 17, 1930) is an American columnist who has appeared regularly in various newspapers in New York City, where he lives. On November 2, 2004 he retired as a regular columnist from Newsday but stated his intention to continue writing. In his final Newsday column, Breslin incorrectly predicted a Kerry victory in the 2004 election. In 1969, he ran unsuccessfully as an independent for New York City Council President allied with writer Norman Mailer running for Mayor, with the agenda of New York City secession as the 51st state. He won the 1986 Pulitzer Prize for Commentary. Among his notable columns, perhaps the best known was published the day after John F. Kennedy's funeral, focusing on the man who had dug the President's grave. The column was indicative of Breslin's style, which often highlights how major events or the actions of those considered "newsworthy" affect the "common man." Breslin is the author of a biography of Damon Runyon (Damon Runyon - ISBN 044050502X) and several novels, the best-known of which is The Gang That Couldn't Shoot Straight (ISBN 0316111740). war is always local. People think that even a war that we're not actively involved in fighting isn't local are wrong, too. They all affect everyone, everywhere. Of course, when a local soldier dies, it is felt all the more. What is tragic is that young people are volunteering to go into the service - TOO YOUNG and really not understanding what they will face, how their souls will be scarred for life, if not their bodies. How their families will be affected forever, maybe even their entire family line will perrish should they die. They and their parents think they are being real Americans, fighting to protect us and to help others. In a few cases, they might be right about that. But in most, they're not. We know that the service offers the poor a way to have an education and salary. We also know there are better ways to accomplish that. There are people who love the military and they do belong there - that's in their soul. I say, let them go and follow their path. In my opinion, they are the only ones who should be in the military, since most countries seem to have to have the military. I would be in favor of slashing our "defense" budget in half. That would still leave us outspending the rest of the world five or six times on our military. And we would still have enough nuclear weapons to simultaneously blow up the Earth and several neighboring planets. That should be a sufficient deterent. And I would pull out completely from the Middle East. And from nearly all the military posts (more than 200) we have all over the world. This is not isolationism. It is a step back from imperialism. I agree with what you said Vibrani. Well said. I am walking in Rosedale on this day early in the week while I wait for the funeral of Army soldier Le Ron Wilson, who died at age 18 in Iraq. He was 17 1/2 when he had his mother sign his enlistment papers at the Jamaica recruiting office. If she didn't, he told her, he would just wait for the months to his 18th birthday and go in anyway. He graduated from Thomas Edison High School at noon one day in May. He left right away for basic training. He came home in a box last weekend. He had a fast war. a great writer has spoken out against this president and this war. You know, of course, that Pinter, Mailer, Dideon, Breslin and the like are all foul mouthed impolite people, don’t you? What makes them impolite? They speak the truth, and that, as all we adults know, is unforgivable. "Breslin, you always were a blubbering coward. You dishonor the memory of this brave young man who died thinking he was doing the work of a patriot, and so he was. You dishonor your homeland, in it's war on radical Islamic terrorism, and you give aid to the enemy by showing your hatred and disrespect for our president, you are a traitor and a coward. U.S. Army 42270688 WW2." Lofty, isn't it? Quite a lofty discourse here. The goons and thugs have spoken. And though their spokesman occupies the White House don’t fear. There surely must be some voices on that thread who agree with Breslin’s final sentence. I am from Australia. Our country has troops in Iraq supporting the Americans. Its a bloody long way from Australia to Iraq and America. 24-31hours flying time. We look after our mates. Americans are our mates. When those towers came down we all felt for America. We have all sorts of people in Australia and as long as they want to live our carefree way of life they are welcome here. Leave the politics and the religion behind.It doesnt matter to us about the oil. We have heaps of our own. We have massive reserves of Natural gas and we are basically a mine for the rest of the world. So how local is this war? I hate war. I reakon there should be no religion. It seems that where there is religion there is war. Historically war was war because of religion and because of greed. Any religion that gives the OK to killing is bulldust. Once a killing is made then there is another killing and so on. It never ends. So who is going to stop the killing? Who is going to stop the war. When? How? Does anyone think that an Iraqi mother and father and an American mother and father that loses a child to war gives a dam about the why? They want their child back, they want their family. I hope it ends soon. Americans should tell George Bush that there is no winning in Iraq or anywhere else that there is war. War is loss, sadness, death, destruction. Not winning.I think there was 3000 people killed when the towers came down. Add to that another 3000 and climbing with the American troops that have died and thats 6000. So how can America win. They initially lost 3000 they have lost another 3000 so from here on its all down hill loss loss loss. It can never be called a win. Never. Lets hurry up and get out of there. it was wonderful to read John Tagliabue's 2 comments at jazzoLOG. I just returned from a Hungarian family reunion (Dana's side) where all the men seem to be named Joe Uveges. We all even got Tshirts that said You might be an Uveges if there are only 3 names you can give a boy. I'm wondering if things are similar at a Tagliabue reunion. Even a John Tagliabue reunion. This John Tagliabue must have Googled to find this, and therefore knows of the other distinguished ones---all related apparently. By the way, it's pronounced TAL ya BOO ee...although the football guy says it the way most non-Italian Yanks do the first time.